Fletcher gave this coffee cup mug warmer to his Mom for Christmas–the perfect gift for January mornings in Montana. It was so cold in Joy’s kitchen this past week-end. Of course, we grandparents are up hours before the household of teenagers comes down the stairs, and long before the heat turns on, and I was content to lounge in bed in Fletcher’s room, as the space heater beamed out warmth. We hate kicking him out of his space when we come to visit, but Joy says it’s a great opportunity for her to fumigate his quarters. There’s lots to study in the room of a 17 year-old grandchild, who will soon be off to college. Old football photos of him hang on the walls, and weird graphic posters of bands he likes or concerts he’s attended. Ticket stubs from the prom, and the race bib from a cycling race are pinned to a bulletin board. There are a slew of tall trophies, with a motorcycle perched on top, which line the shelves above his desk, from the days when he raced motocross, as such a little boy. A welding helmet rests on the top of an armoire. In a corner, I saw the used speaker I had given him, plugged into what must be an amplifier, and an electric guitar propped up against the wall. At the foot of the bed, there is a three-tiered shoe rack, neatly lined with enormous Nike sneakers of all colors, including bright red, which looked like something the giant might have worn in Jack and the Beanstalk. And a collection of inspirational quotes, written in black magic marker on 8×10 pieces of paper, are stuck on his door with pushpins, which led me to believe, The Kids Are All Right. It finally looks like winter outside. On our drive home across the state yesterday, we said it looked like November, and where was the snow, but it began snowing for the final few hours of the trip, and when I tried to drive up our road this morning, I couldn’t make it. That’s a first. Studded snow tires and four-wheel drive have always worked in the past, and it was only the heart-stopping slide coming down that has been taking years off my life at a rapid pace. Don was able to rescue the paralyzed car by shoveling gravel beneath the wheels, but that was IT for me–I’ve made it an official stay-at-home snow day. I shoveled the stone steps, and Gary, the cat, went with me for a little snow walk in the woods, and I took some winter photos. I’m about to bring in more wood and start the fire early today, so I can snuggle in with my stack of books under a wool throw. The soup tonight is potato leek with Dijon mustard as a secret ingredient. There’s a brand new bottle of Jameson Black Barrel in the cabinet. Not so bad, really, as we plod along through the month of January, looking forward to winter’s bitter end, someday. Bald and running to fat. On the unshovelled morning after the storm. This entry was posted in Uncategorized on January 21, 2019 by rebsuebauder. Today is Twelfth Night and the official end of the holiday season, and, in medieval England, it was back luck to take down your Christmas tree before today. It was the final day of celebration before everyone went back to the humdrum of work, and the dreary dark month of January. I jumped the gun this year by taking down the tree last week-end—perhaps bringing bad luck to my house—but the above freezing temperatures and lack of snow made me do it. This winter’s weather just feels weird and is down-right unsettling. The snowpack is at about 85% of average, so I guess that’s not so bad one week into January, but there is green grass everywhere in the valley, watery ponds, and it’s hard to develop a ‘mind for winter’ in weeks such as these. I find myself prematurely thinking I’ll hear robins on my walks. Because of the earth’s tilt, we’re having the latest sunrises of the year, so mornings are darker than ever, but as Joy has been posting her photos on Facebook, these are some of the most beautiful sunrises we ever see. Not once has our road been plowed, and I have to say that it’s a delight to come home and not slide down on ice. At 7:30 a.m. today, The International Space Station did a four-minute fly by, and it was so pleasant to walk down to the dock on crunchy grass rather than through knee-deep snow. Although there was light coming up in the east, the Station was brilliant, rising on the horizon at WNW, and when we turned to watch it descend eastward, there was Venus above the tall trees, even brighter than the Space Station. The new young moon, that tiniest of fingernails, should be rising about 5:30 p.m. tomorrow across the lake, and, if my luck holds, there will be enough breaks in the clouds to make the first sighting. I’m feeling somewhat anxious about the moon, after China’s Chang’e-4 landed on the far side of it this week. According to Earthsky. org, the rover landed on a site where space debris pounded the moon long ago, possibly exposing the layer beneath the crust, whose contents will teach scientists more about the moon, and, therefore, more about our solar system. There is no way not to be astounded by astronomy and astrophysics, and to be amazed by the human drive for exploration and knowledge. It gives me goosebumps. In Searching for Stars on an Island in Maine, the physicist, Alan Lightman, writes with such a sense of wonder as he explores the universe, and I can feel that when I read his books. But, like in the movie Wall-E, I picture a moonscape, with a permanent space station, and am saddened by all the ways we might trash the Mystery. Sigh. Well, with the Christmas tree down and decorations put away, I’m running out of excuses for avoiding the major purging and de-cluttering I signed up for with myself this January. But, if taking down the ornaments is any indication, this may be a slow process. This entry was posted in Uncategorized on January 5, 2019 by rebsuebauder. We are home to start the New Year. Cormac, 10 years old, sent me a text from California last night, “We r missing u here!!! !”, including the emoji of a face crying copious tears. Yep–as always, as good as it is to be snuggled back into our cozy, quiet home, we r missing u too, very much. Scant snow fell while we were gone, but it’s bitter cold here this morning. The winter stars were brilliant, with the waning crescent moon lighting up the trees in the east. The kitties got to come in for a little fireside visit last night, but Chatpeau is happily asleep out on the porch, curled into the wool throw on the Adirondack chair. We get ready for Winter, and a new year. Every New Year’s Eve, I think about possible resolutions or intentions, and contemplate the enormity of the blank slate of a brand new year. There was that one year I wrote down five things about myself that I wanted to purge, and wrote each of them on a little piece of rice paper, and then burned them one by one in the fireplace. I can’t remember what they were, so I don’t know if I was purged. I was reading earlier this morning about traditions around the world, and after I learned how in Japan, at midnight, temple bells ring 108 times, matching the need to be purified before the New Year, I felt exhausted before this day even got underway. So, I don’t know…it’s still early and morning alpine glow has turned the snow on Blacktail Mountain, across the lake, a lovely shade of pink. I can see lights now over there, as people begin to wake up and start their final day of another year. The lake is quiet, a lovely shade of baby blue/ pale lavender, and a dozen or so ducks just paddled by close to shore, going south. Before he left to ski, Don made his famous green chili, so the warm house is filled with New Mexican memories of kiva fireplaces, farolitos on adobe rooftops, and the smell of piñon pine. I could take down the Christmas tree, but it is so enchanting come dusk, as l’heure bleue spreads that beautiful shade of winter blue behind the reds and golds which glitter on the Grand Fir tree. The ducks are now floating back up this way, so, perhaps, it’s time to get a move on. Maybe, I’ll just start with breakfast, over a few more good poems, and go from there, on this final day, before the new year gets underway. This entry was posted in Uncategorized on December 31, 2018 by rebsuebauder. The Winter Solstice has arrived, and the full Long Night Moon was enormous as it slid down into the lake this morning–there will be a glow in the sky on this longest of nights. The wind is raging out there, the wind chime is furiously gonging, and the outdoor Christmas trees are wiggling to and fro. There’s no snow. The Solstice is always cold, dark and still, and incredibly quiet, but all feels in disarray as we begin this day. It’s one of those times in which the ancients would have seen this as an omen, a message from the gods, a long dark night full of foreboding. On my winter mantle, there’s a framed print– a page from an old Scandinavian book of fairy tales–which I got at a flea market years ago. 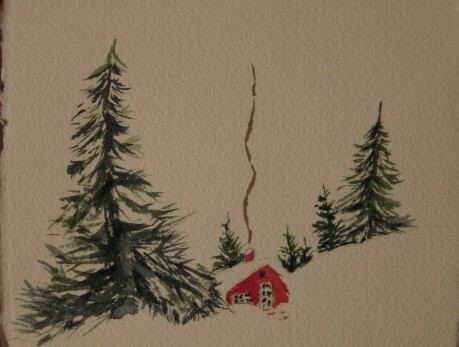 The caption is likely Swedish, and the painted illustration depicts a tiny troll-like figure, trudging through the snow in darkness with a pack on his back, and there’s a small cottage, yellow lamp-light in the window, with smoke coming up the chimney. It absolutely enchanted me, living as I do in dark long winters. In the Arctic Circle countries, this gremlin/elfin creature is called a Tomten, and he has never been seen by humans, but comes in the dark to the barn, and cares for the animals, during the long cold winters. I think all ancient cultures have some sort of wee folk as magical totems–at our house, we have this little elfin creature who guards the dark living room, after we’ve gone to bed. When I researched the origin of Tomtens, it seems to have come from a long ago poem by Viktor Rydberg, and there’s a lovely illustrated book by Ingrid Lindgren, still in print, which translates this ancient poem into a prose story of darkness and hope. In the original poem, the dark night is full of fear and existential loneliness, but it is juxtaposed with winter’s beauty, and, a solitary Tomten–who we cannot see–bringing light, kindness, hope. The Winter Solstice. This entry was posted in Uncategorized on December 21, 2018 by rebsuebauder. There’s this interesting interlude in our weather, from mid-November to mid-December, in which the temperatures are low enough to make ice on the ponds and lakes, but before the snow arrives to cover it up. Once, back in 2004, a few years after we had moved to the lake, a group of outdoor enthusiasts called to say that Birch Lake, in nearby Jewel Basin and a few miles up the trail, had amazing ice. Don and I grabbed our skates and hiked up to join the families who were skating on ice which was so smooth and so clear, that when you glided across the pond, you could see schools of fish swimming below your feet. I remember laughing out loud. Then, suddenly, the ice began to break at the edges of the lake and you could feel the whole pond begin to move, and there was this loud sucking noise, like when you pull the plug in a bathtub. Everybody skated as fast as they could toward shore, and I remember just running off the lake, then running on the ground for a long time, knowing I was ruining the edges of my hockey skates. None of us had any idea what had happened, as we watched a two-foot wave of water slosh up the sides of the lake and wash back over the ice. Later, we learned that a 7.9 earthquake had occurred in Alaska, at the same time we were skating, and there was an article about it in the local paper afterwards. We still talk about it this time of the year. We have this little pond on a neighbor’s property, a brief walk from our house. You follow the deer path, cross the neighbor’s driveway, up a short knoll through the trees, and there’s the pond. The neighbors are not here in the winter, but Don called them in San Diego to get permission, and they just asked him to please not fall in. It was A Wonderful Life Christmas last year, when the grandkids were all here, and they sledded down our long, steep, and winding snow packed road, and they skated on the little pond, which Don spent hours each day, clearing snow. Last week-end, we had a few brief days of ice, when the temperatures went down into the teens for both day and night. Don loved clearing the ice and skating in the afternoons. There’s an old rusted aluminum lawn chair at the edge of the pond, and I like to sit there, watching, and listening for cracks in the ice, and smelling the trees, and looking for eagles. The kitties followed me through the snowy woods and Gary assumed the goalie’s position while Chatpeau huddled in the underbrush, a safe distance away. But, the days all this week have been windy with temperatures in the 40’s. The snow in our yard is gone, and there was a clear path in the yard as we walked down to the dock this morning, to watch the Geminid meteor shower. It was so warm that we wished we’d brought a blanket to put on the dock, so we could lie down on our backs, but, we saw over a dozen shooting stars, before our necks began to hurt. Rain is predicted tomorrow. The forecast next week doesn’t look much different, and people are trying to remember if we’ve ever had a Christmas without snow. It seems that it always comes, just in the nick of time, bringing new adventures, often harrowing, of deep snow and ice-covered roads. But, I think the transient wild ice days may have come and gone for this year. This entry was posted in Uncategorized on December 15, 2018 by rebsuebauder.